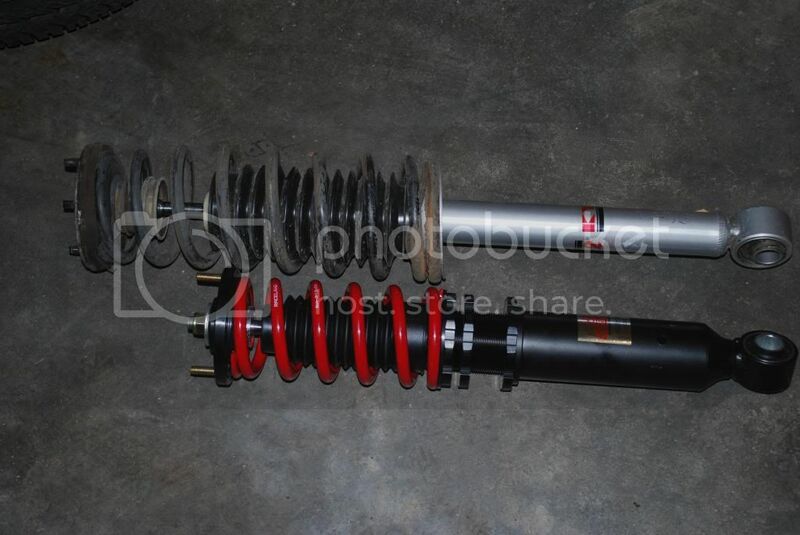 I recently got a full set of Raceland S13 coilovers. 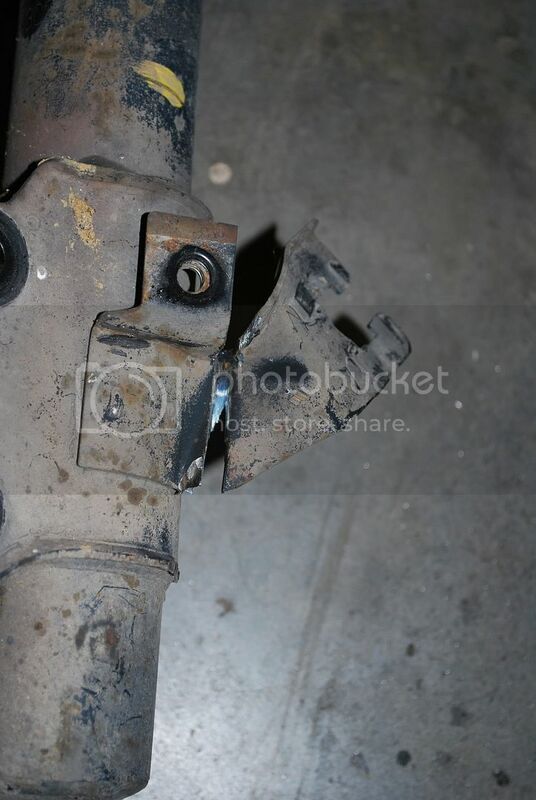 My front suspension had God-knows-how-many miles on it (the speedometer and odometer quit working while the previous owner had the car), and the rear dampers were beyond blown when I bought the car (to the point that it was dangerous). I replaced the rear dampers with some KYB GR2 units shortly after getting the car home, but it was still a bit under sprung and under-damped back there. 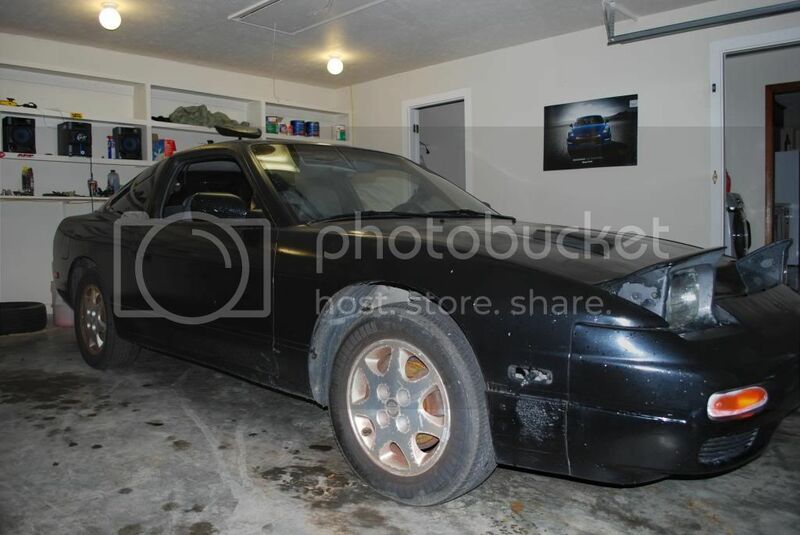 Back story – This car was bought with intentions on turning it into a truck. I’ve raced it a few times and drove it back to Mississippi from Florida when I bought it. It isn’t pretty… I know that. Feel free to make fun of it. 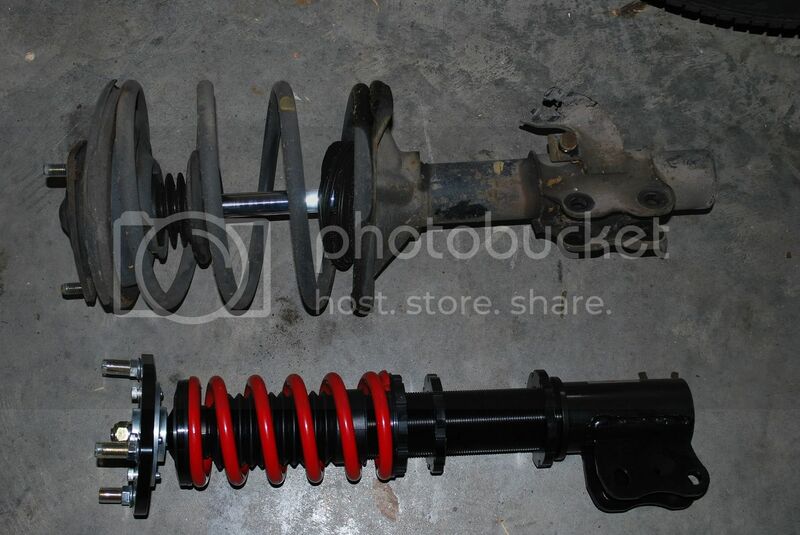 I also have an S13 coupe with KYB AGX and Eibach pro-kit springs to compare this suspension to. I’ve also driven a few other 240’s with coilovers. I started on the rear. I jacked the car up by the pumpkin and supported it with jack stands. Pull the wheels off, then pick either the top or bottom to remove first. I kinda like doing the top first just in case the assembly wants to fall down (which happens more on the front than the rear) once the bottom is undone. Pop that guy open and remove the 2 12mm nuts holding the strut to the tower. 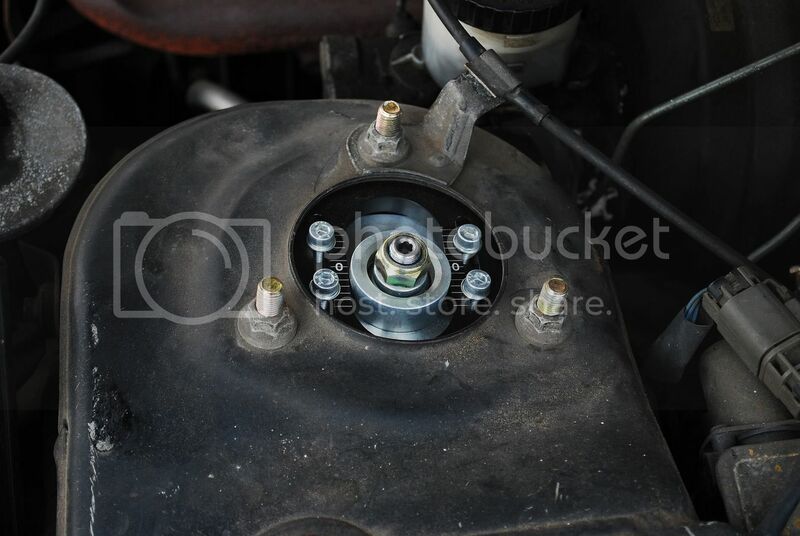 Next, remove the 17mm nut and washer from the bottom mount (located at the bottom of the knuckle). Once that is done, you’ll have to push the shock off the bottom mount. You might have to bounce up and down on the knuckle assembly (like, on the rotor hub area, pictured below) a little bit while pushing the strut off (in towards the center of the car). 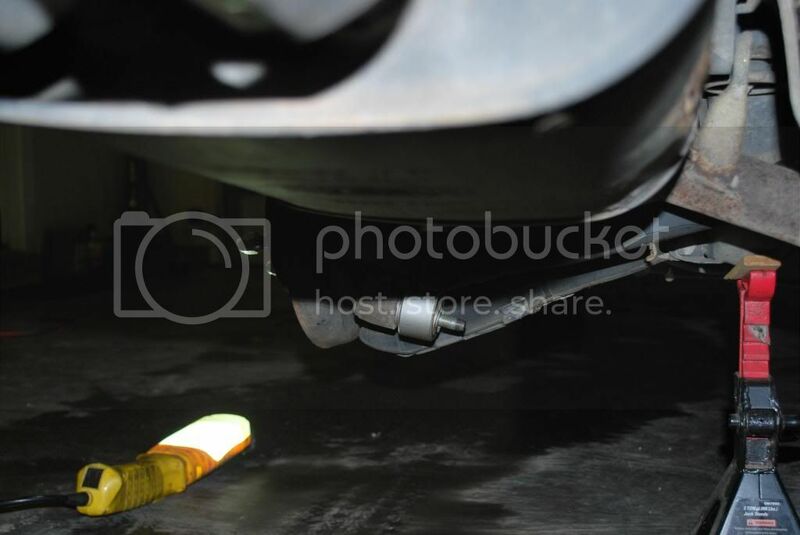 Once it comes off the mount, swing the top end out through the wheel well and remove it completely. Out of the box, they are set up for a pretty substantial drop. I adjusted mine so as to get a more stock-ish ride height. I don’t have adjustable rear upper control arms yet to adjust my rear camber enough to accommodate a big drop, but these coilovers will go plenty low. I settled on about a 1.5” drop- which was between 15 and 20 full turns from the bottom mount being completely removed. However low you go, you’ll want to make sure you set up both left and right sides the same, unless you’re doing some circle track racing or something. Installation is essentially just reverse what removal was (aside from using the 13mm upper nuts as opposed to the 12mm factory ones), especially with a drop this minimal. If you go much lower, you’ll want to break the bolts loose on your control arms so you can swing the knuckle around freely (you remove pre-tension on the bushings this way), not to mention you’ll want to re-set that “pre-tension” to the lower ride height so as to not pre-maturely blow your bushings. 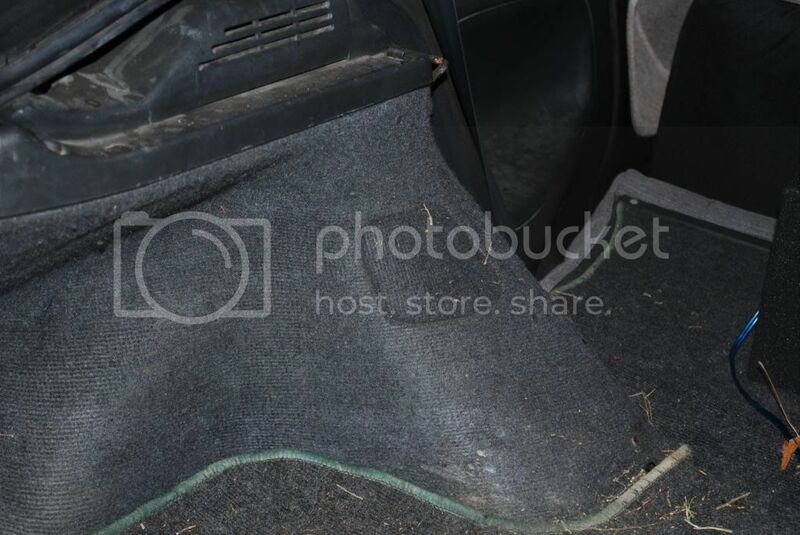 IDEALLY, your best bet is to tighten everything back up with the full weight of the vehicle on the ground, but that is tough to do unless you have a pit. You could put a jack under that corner to pre-load the suspension a bit though. Once it is in this position (bolted back into the bottom mount and strut tower), you’ll have to adjust the spring pre-tension. Back off the lower perch until you get up-and-down movement on the spring, then tighten it back up until you get no more up-and-down, but can still rotate the spring slightly. Lock it down like a jam nut using the 2 provided wrenches. Do the same with the bottom. That’s it, DONEZO. Repeat for the other side, then jack up the front. Blown dust boots. Never good. That’s when you know you can look forward to some serious handling improvements. 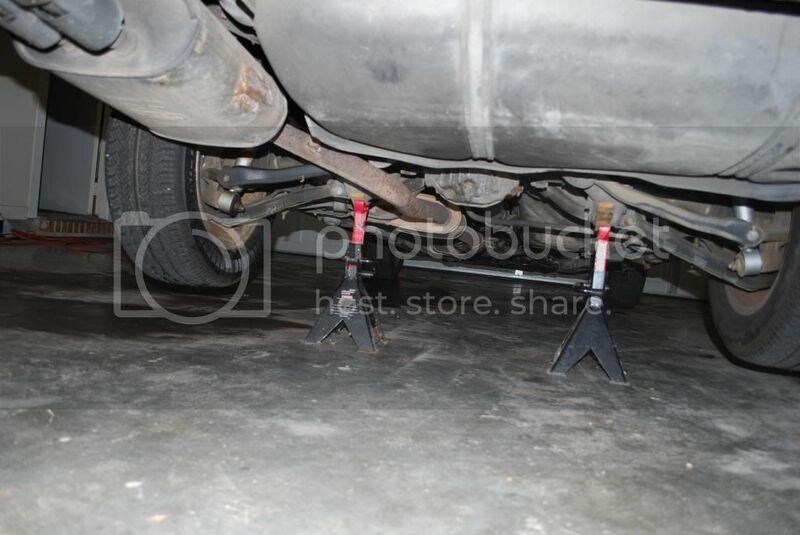 The front strut removal is spectacularly easy. 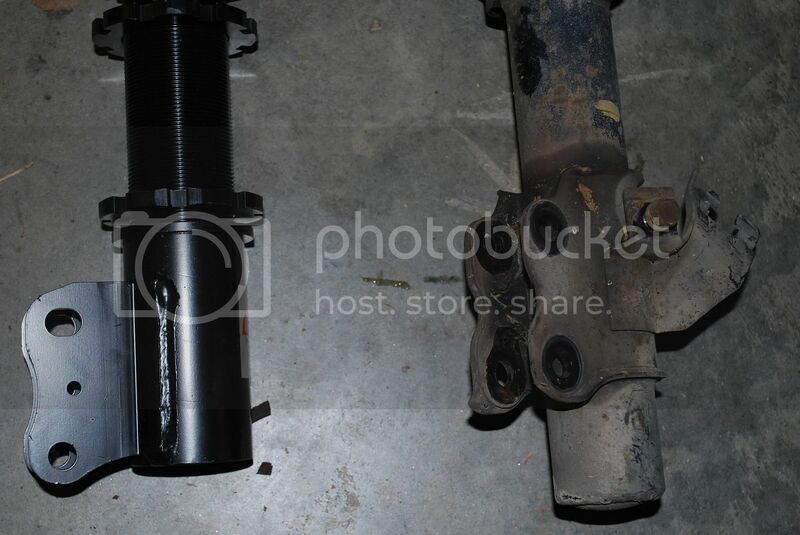 My car has ABS, so first remove the ABS line bracket, then pop the hydraulic line off the factory strut. Loosen the 3 14mm factory strut tower nuts, followed by the two 17mm bolts from the knuckle. She drops right out. The front has a bit more of a potential to drop than the rear. I turned the lower mounts in 75 threads to set the height. At this point you might notice a problem. 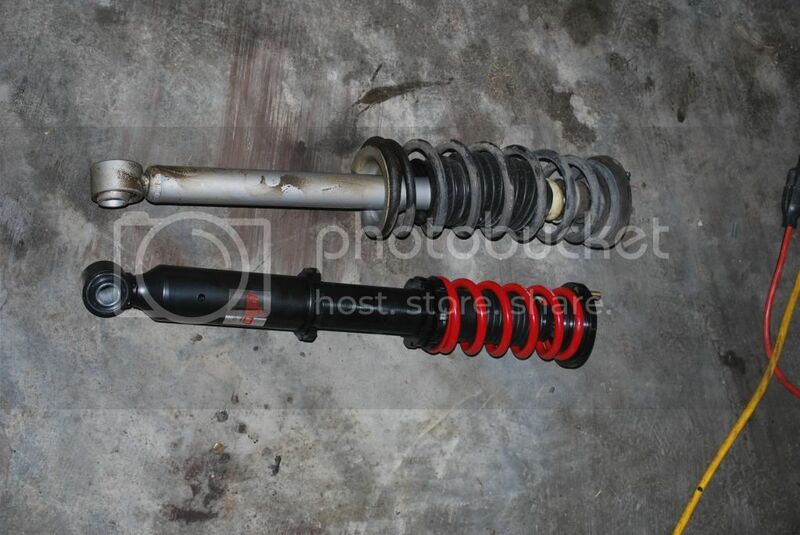 The factory strut has the ABS and brake line mounts on it, but the Raceland coilovers do not. I cut the factory mounts off the strut and welded them to the lower mount on the coilovers. If you go down this route, you’re going to want to pull the lower mounts off and temporary bolt them to the front knuckle so you can mock everything up and either mark it, remove, weld, or cover everything up with a welding blanket and tack-weld them with everything in the vehicle. I then shot some black enamel all over everything. They came out pretty good! Anyway, back to the install. You might have noticed that the top hole on the lower strut mount is sort of slotted. 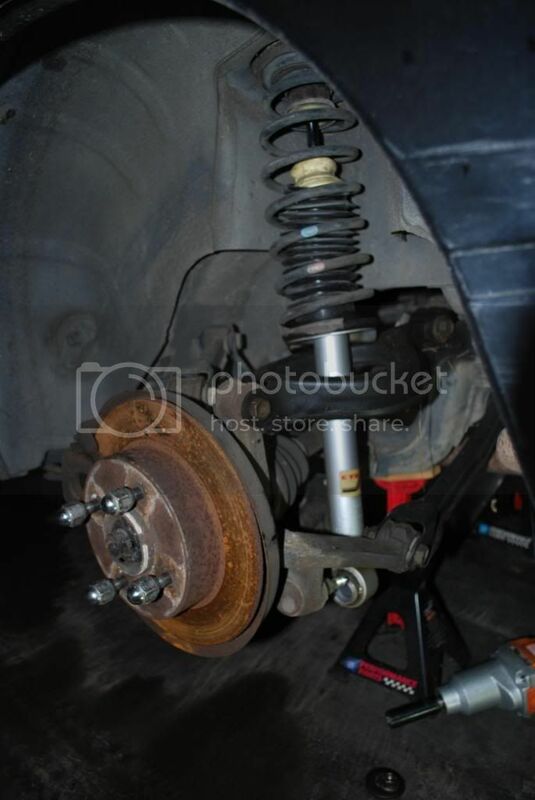 It’s pretty safe to say you bought coilovers to lower the vehicle, so when you go to bolt the strut back in, you’re going to want to go ahead and swing the top of the knuckle as far outboard of the vehicle as possible, then tighten down the bolt. This should give you the best camber starting point (so you don’t have to mess with the camber plates up top as much). Again, here you’ll want to break loose the suspension components so you can swing the knuckle assembly as you see fit, as well as re-set the bushing pre-tension. 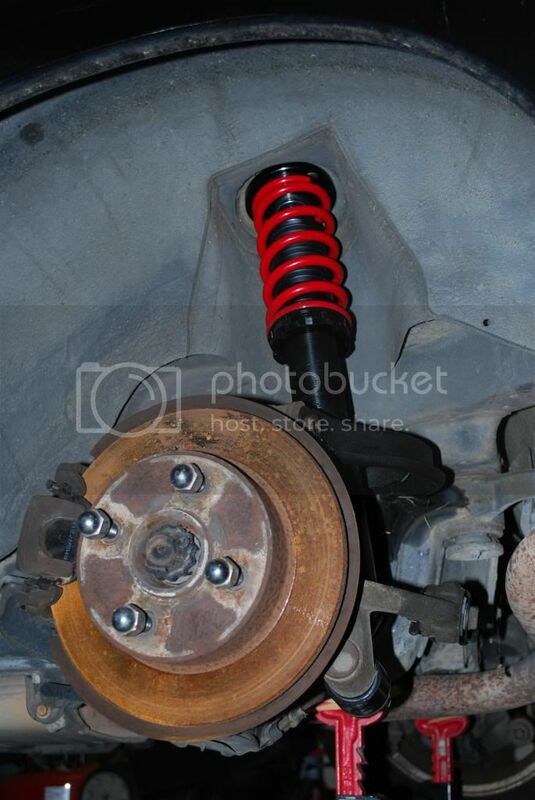 Again, once the coilover is in, you’ll have to adjust the spring’s pre-tension just like the rear. 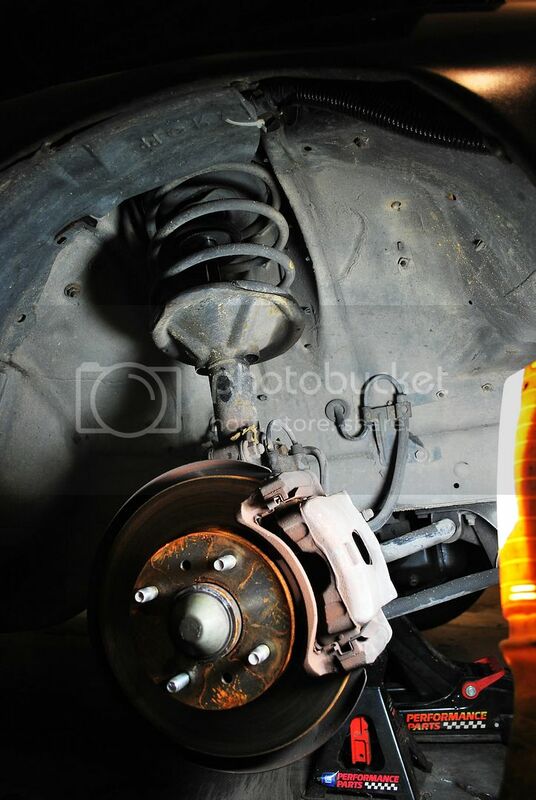 Once that is done, you can drop the car down and see how horribly off your front camber is! At this point, if it is close enough, you can drive it to get it aligned. If not, go ahead and adjust your camber via the camber plate through the strut tower. I loosened up the 4 allen-head bolts (5mm allen wrench) and actually used a block of wood as a drift. I then hit it with a hammer lightly until the camber looked ok. Re-tighten the 4 screws (figure about 15 ft*lbs each). This will get me to the alignment shop. So it’s no real secret that Raceland coilovers are of the cheaper variety on the market. These don’t come with adjustable dampers or anything (which would be nice), but at $469 a set, they’re a hell of a value. First, the good news. 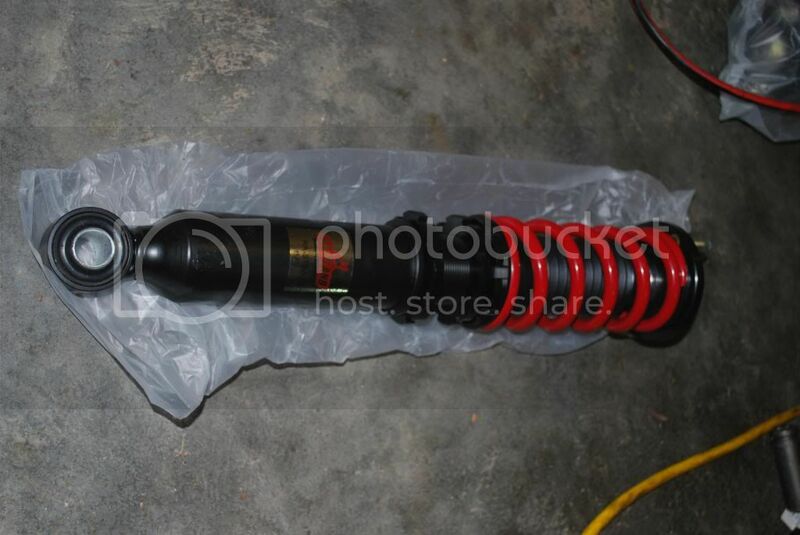 These coilovers can be had for pretty much LESS money than actually replacing your factory suspension. Handling is improved quite a bit. Ride height becomes adjustable (for those that want to know, these will go plenty low). Front camber becomes adjustable (so if you’ve been in an accident, you can correct anything that may have gotten knocked out of whack). The ride really isn’t too harsh at all. Now, the only downside to these: The dampers (especially the rear) are a little on the weak side. There’s definitely some bounciness going on that could be cured with a stiffer damper (or adjustable dampers). However, unless your road is laid out as such that you hit the natural frequency of the spring/damper combo, it really isn’t too bad. I recently drove a friend’s 240 that had KTS coilovers. The ride was definitely stiffer, but also had pretty much zero bounce (even when set to full soft adjustment), so given the option for a daily, it’s a bit of a tossup between hard harsh ride and bounciness. I’d probably go with the Raceland coilovers if it were the only thing I could have for the rest of my life. 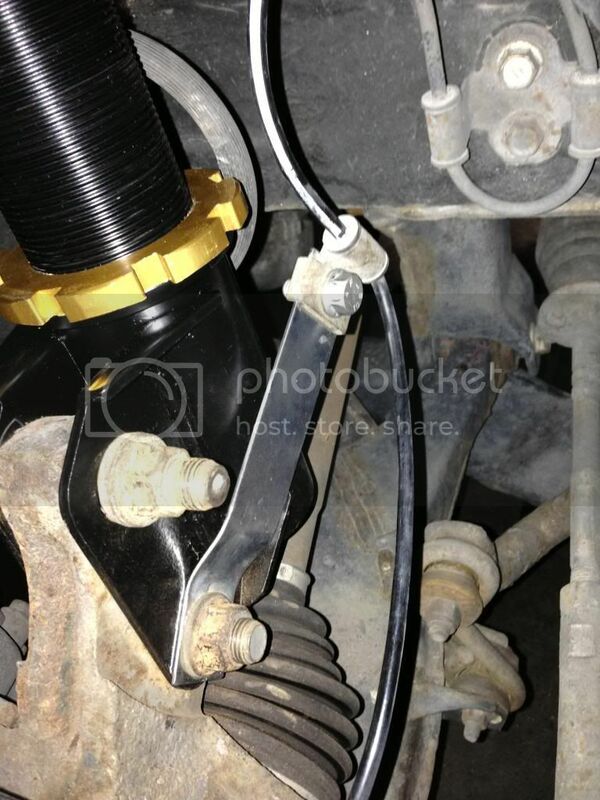 They could also use some mounting options for the brake lines. The bottom line – You’ll be hard pressed to find a better “bang for your buck” suspension setup, or modification, for that matter. 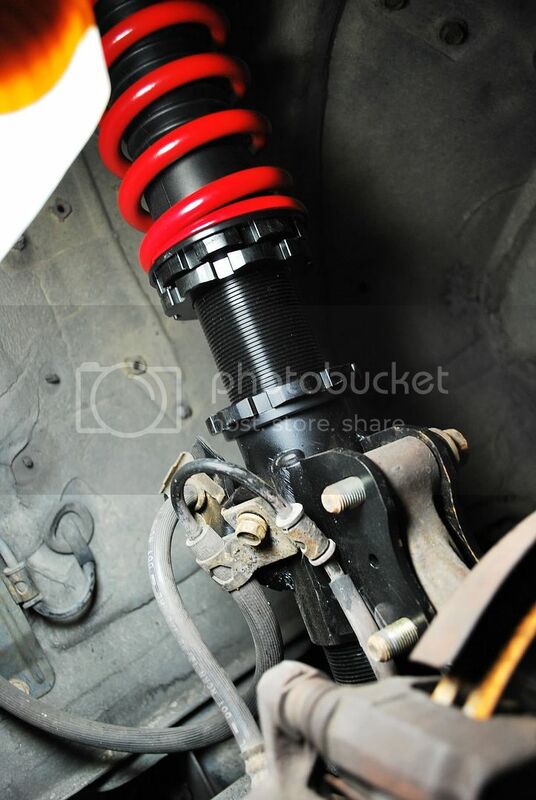 The all important “fun to drive” factor increased DRAMATICALLY with the installation of the Raceland coilovers. I have roughly 2,000 miles of seat time on these since the install, so longevity is unknown – but I’ll be sure to post any problems I may have with them.